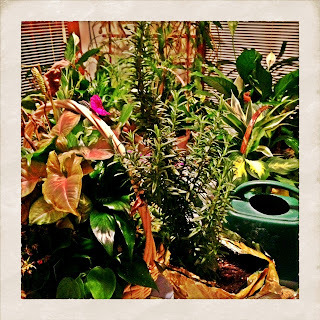 Do you know how to sell a rosemary plant to a gardener who has a sun room full of house plants? I'll tell you how you sell a rosemary plant to a gardener who has a sun room full of house plants. It really is quite easy. First, have two rosemary plants for sale. Then wait for the gardener to come by your booth at the farmers market where you have the two rosemary plants for sale. When the gardener reaches out to gently touch the rosemary plant so she can smell its rosemary-goodness, say something like, "Doesn't that smell wonderful?" Then the gardener will say something like, "Yes, it does. You know this rosemary plant doesn't look like those that they sell at the big box stores." Then you say, "It isn't, it has longer leaves and straighter stems." At this point, the gardener will remember that she has a sun room full of house plants many of which are in containers without good drainage, so she really should repot them soon. She will slowly back away and say something like, "Let me see what else is here, then I'll come back by and decide." Don't be discouraged at this point. Be patient. Soon another gardener will come by, and you can repeat the same conversation, only this time, that gardener won't hesitate to buy one of the rosemary plants because she won't have a sun room full of house plants in containers without good drainage that really should be repotted. She will definitely buy one of the two rosemary plants. Then across the room, the first gardener, the one with a sun room full of house plants, many of which are in containers without good drainage so she should really repot them, will glance back at your booth and see the other gardener beaming with pride, walking away with her new rosemary plant. Instantly, the first gardener will realize that she is at risk of not getting a rosemary plant that isn't like those she sees in the big box stores because it isn't like those. It has longer leaves and straighter stems. She will forget all about the house plants in her sun room, many of which are in containers without good drainage so she should really repot them. She will forget about everything and everyone else at the market. She will walk quickly, almost run, to get back to the booth, lay her hand on the rosemary plant and say, "I'll take this one". Then as she walks away with her new rosemary plant, forgetting momentarily that she has a sun room full of house plants, many of which are in containers so she should really repot them, and beaming with pride because she got the last rosemary plant, the one that is different from those in the big box stores because it has longer leaves and straighter stems, you can casually mention that after the holidays, she should really repot the rosemary plant. Glad to know you didn't lose out! A gardener must be so careful not to lose the chance for a special rosemary plant. Great sales pitch! Glad you didn't miss out on a naturally formed rosemary instead of those silly ones trimmed like conifers. Those farmers market plant sellers have this down to a science. Did you pay a premium price for all the care and natural growing methods used on this prize rosemary plant? I hope the rosemary will be wildly happy in your sunroom ... once you've repotted it, of course. You are such a genius at understanding the psychology of gardeners. I have to go water my plants now. They have very good drainnage. I want a rosemary plant with straight stems and longer leaces. I'm glad you didn't miss out on this special rosemary plant! I see you haven't posted the past two days, as you often do--you've probably been busy repotting all those houseplants. I want a rosemary plant! But, more than that, I want a sunroom, so I can fill it with plants.